What is the eZLS? 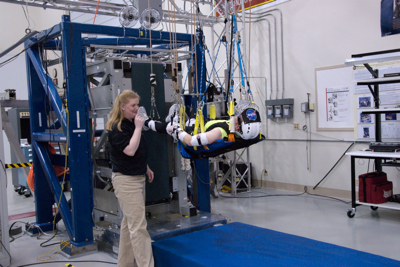 It’s the enhanced Zero-Gravity Locomotion Simulator. 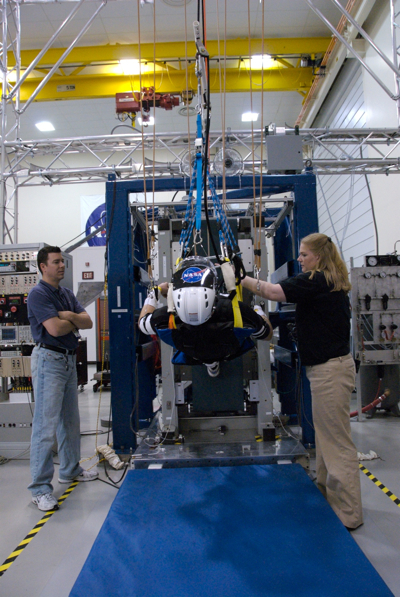 Essentially it’s a vertical treadmill that can simulate walking or running in a reduced gravity environment such as on the ISS, the Moon, or Mars. Blair and I had the opportunity to run on the treadmill to experience what astronauts go through when they work out on station. 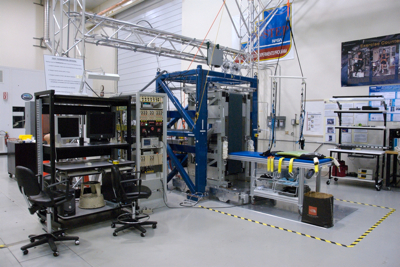 This piece of equipment is housed at NASA Glenn Research Center and is part of the Exercise Countermeasures Laboratory. I have to say this is one cool piece of technology. The goofy co-host had first crack at the treadmill. He came in wearing colorful and loud workout gear sporting 1980’s socks and headband. I think he watched Chariots of Fire before the shoot. Check out our Facebook page to see more pictures of Blair stretching and posing for the camera. Next it was my turn and my dress was a bit more reserved. I consider myself a runner so I was really paying attention to all the details. Kelly Gilkey made sure everything looked good and that I was secured. I started out by walking at a 3.5 mph pace. It took about 30 secs to a minute to get accustomed to the treadmill. At first I felt my feet going everywhere and the force plate, which is free floating was moving in all directions. Once I got the hang of it I then started with a light jog (5.5-6.0 mph). The treadmill was very fluid and easy to run on. I never passed 7.0 mph due to time constraints but next time I would like to bump it up to 9 – 10 mph to get a good workup or maybe run a half-marathon. Special thanks to Gail Perusek (Project Manager), Kelly Gilkey (Lab Manager), Mike Rossiter (Operations Engineer), and Mark Savina (Operations Manager) for allowing us to cover the eZLS. This will make a great NE@ segment. So, is it easier to work out in space than on Earth? The eZLS looks really cool! I can’t wait for this NE@ segment! Amazing machine! More so I wanted to test … https://www.nasa.gov is the best! Wow! What an awesome project! Does a person burn as many calories working out in the gravity of the moon or mars as they do in standard earth gravity? Just curious . . .
Now I’ve seen my share of treadmills but I’ve never experienced anything like this. This is definitely something I wish I could run a few miles on! Does a person burn as many calories working out in the gravity of the moon or mars as they denture do in standard earth gravity? This eZLS will be very useful for astronauts. It is a very appreciable work of NASA and its features are amazing…. Wow I guess this is going to be the latest slimming “craze” for the year lol ! Nice photos guys. Is seems you guys are having fun out there! I am really savoring studying your nicely created content articles. It seems to be like you spend a great deal of work and time on your blog. I’ve bookmarked it and I’m looking ahead to reading new content articles. Maintain up the excellent function it. Excellent article. Amazing pictures and great stuff. NASA makes our dreams reality. Thanks. Does a person burn as many calories working out in the gravity of the moon or mars as they do in standard earth gravity? Just curious. Thanks for the question. 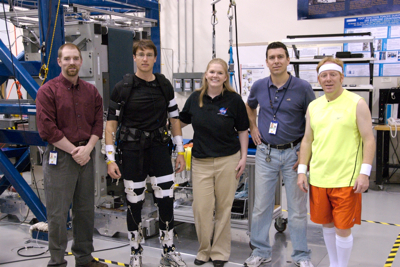 I don’t have the official answer, but when we were running on the eZLS with lower gravity settings, we were able to run at a good pace without increasing our heart rate as much as we would on Earth. As a result, I think you burn fewer calories at the same pace than you would on Earth.